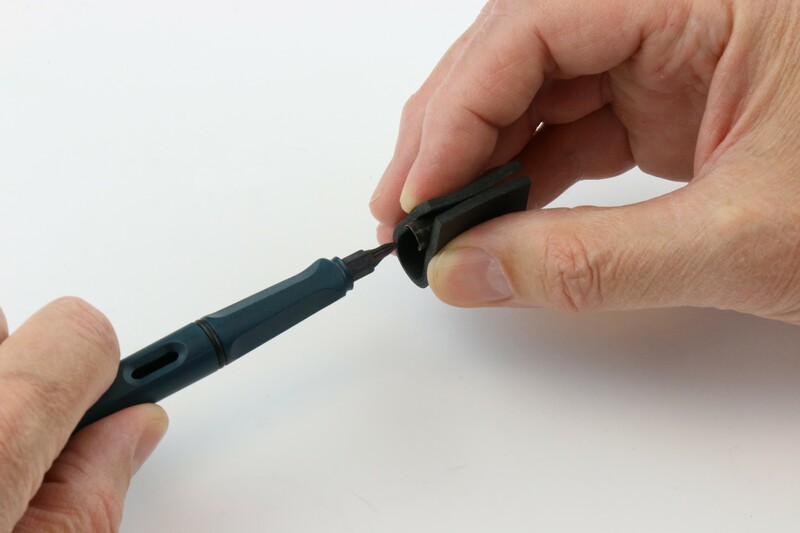 A very common question asked by our customers is how to do a Lamy Safari Nib Swap. The Lamy Safari is a great starter pen that comes in a large variety of nib sizes. Thanks to the genius of German Engineering, swapping between these nibs is super simple! Please note that this same technique can also be used on the following pens: Lamy Joy, Lamy Vista, Lamy Logo, Lamy Al-Star, Lamy Joy Al, Lamy LX, Lamy Studio, and the Lamy CP1. You can also swap the nib between different Lamy fountain pens. 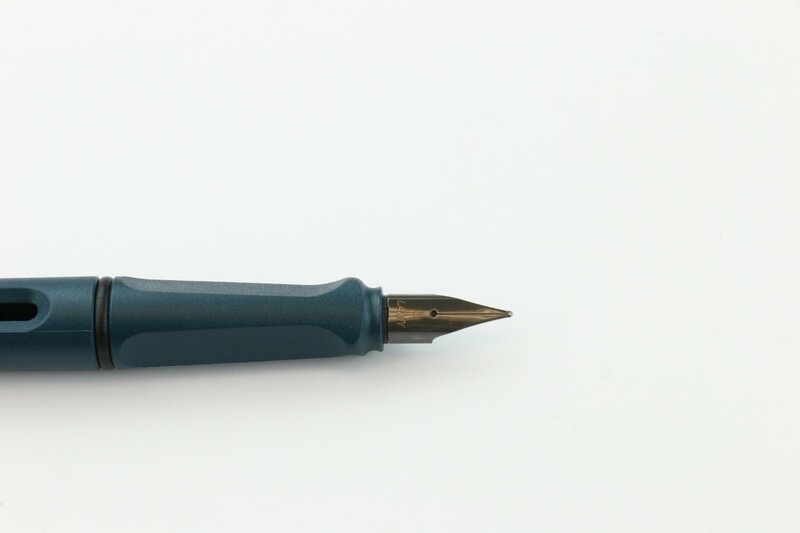 For instance, you can remove the nib from a Lamy Safari and put it onto a Lamy CP1. You can even exchange the nibs with the Lamy Aion pen but you will not have the same rounded nib shape that comes with the pen as the nib design is slightly different. You should not use these techniques on any other Lamy pen, including the Lamy 2000. 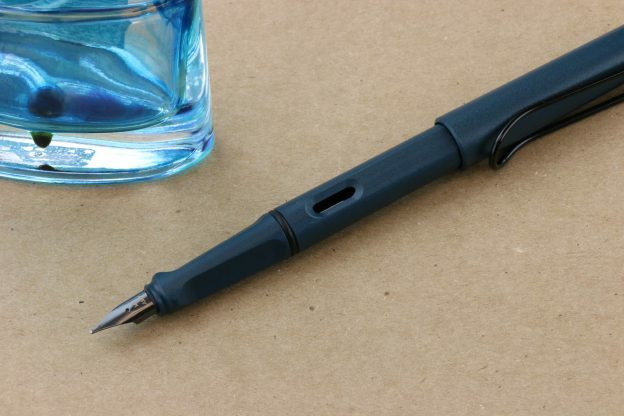 For this guide we used a Lamy Safari Petrol Fountain Pen with a Medium nib. Also used in this guide is the Pen Chalet Nib Grip. First, you will want to make sure that your Lamy Safari is cleaned and flushed out. You can swap nibs while the pen is still inked, but be warned that there will be inky fingers. Next, you will want to remove the cap and hold the barrel of the pen in one hand. Now that you have the pen situated, take your Pen Chalet Nib Grip, and gently fold it around the nib. 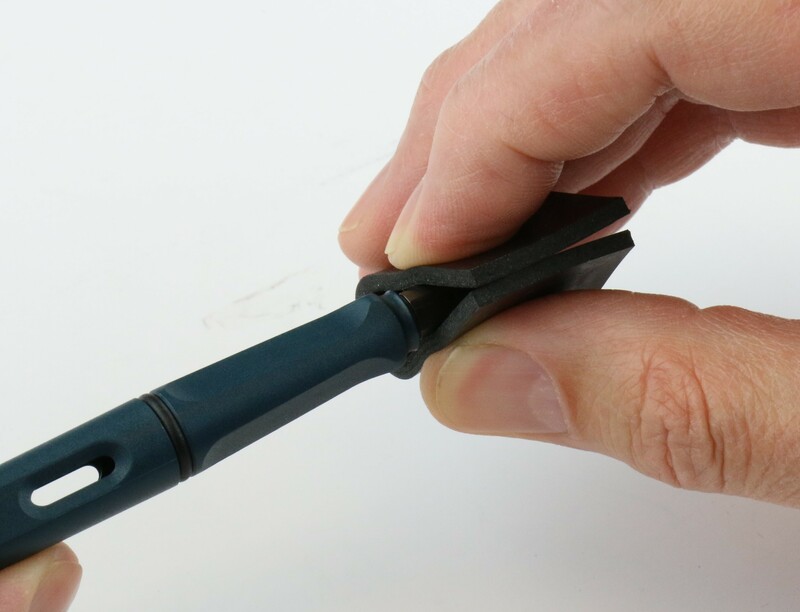 You will want wrap it so that your fingers will apply pressure on the two sides of the nib. A common error here is placing your fingers with one on top of the nib and the other under the nib on the feed. This can cause the entire feed to be removed, instead of just the nib. If you remove the feed it must be inserted at the same angle. Gently apply pressure with your index finger and thumb and pull the nib away from the barrel. Make sure that you have something nearby so you can store the now free nib. Take the new nib in the same hold with the Pen Chalet Nib Grip. 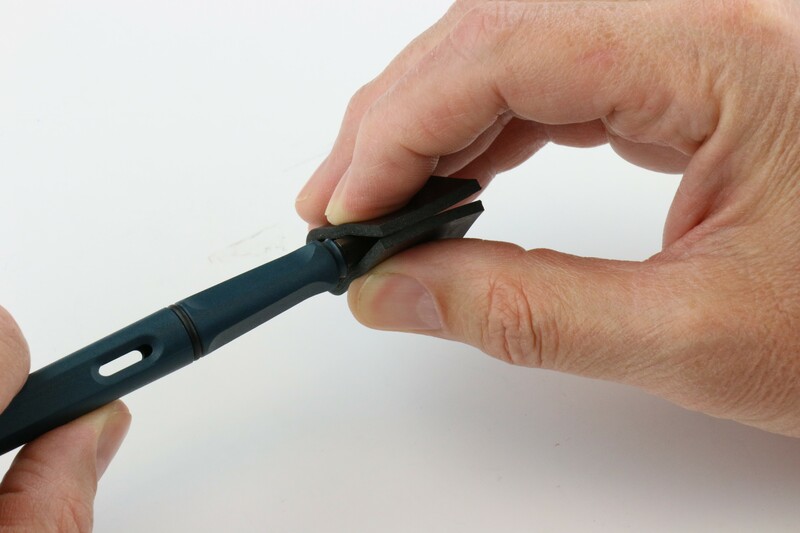 Align the “wings” of the feed with the “hooks” of the nib. Then gently push the nib onto the feed. The feed’s design naturally stops the nib in the correct position. Just make sure that you pushing the nib on gently, and everything will turn out great! That’s all that there is to a Lamy Safari Nib Swap! These four simple steps can help you swap from an Extra Fine nib to a 1.9mm Calligraphy nib at a moments notice! Let us know your thoughts in the comments below! Also, don’t forget to share this with your friends! Remember, we have “The Write Tools for the Analog Writer”! This entry was posted in Fountain Pens and tagged fountain pen, repair & maintenance on July 20, 2018 by Pen Chalet. can I buy a Pen Chalet Nib Grip? I am looking to change the nib on a Monte Verde Pen (Fine Nib) with an Extra Fine Nib, I do not have a nib to change yet, but am looking to buy one. Think you can help me with these?